With tailored policies to meet your needs, we offer various cover levels including; New for Old, Indemnity or a mixture of the two. 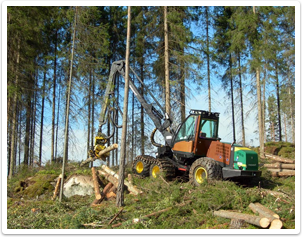 Our policies are designed for anything from a chainsaw to a harvester, forwarder, all terrain vehicle or skylines & cover can also be extended to incorporate hired in plant and employee's hand tools. We also have a great reputation for getting you back to business as soon as possible following a loss.